Every gardener needs the equivalent of Neil Young‘s maid, someone to do the boring jobs, leaving the gardener’s mind free to roam on questions of form and function, or the plan for next season’s crop. Either you pay someone to do the laborious stuff, if you can afford to, or you choose your life partner carefully. So, when I advertised for a handyman, I had no idea I would end up with Mr Zip & Strap. He’s also quite useful with a spade and a fork, and makes a mean Broccoli Pasta. I am not a natural gardener. That’s Sophie’s realm of excellence, which leaves me with the companion task of lifting, moving and construction in her sustainably productive garden paradise. I have come to the realisation that the zip tie and Occy strap are the easiest and most adaptable items in constructing and restraining the vast majority of small garden structures. The zip tie, or cable tie, was invented by Maurus C Logan, who worked for Thomas & Betts in 1958, when it was called the Ty-Rap. Originally developed for the aircraft industry, for binding the long cables in the aircraft, it’s now used in the electrical industry and has far exceeded its original brief. The fact it was invented in my birth year is a more than happy coincidence. old Australian hardwoods. They give up a mean, unforgiving fight, and they blunt drill bits rapidly. The other problem is getting a drill into small confined spaces without stepping on a plant. Heaven forfend! 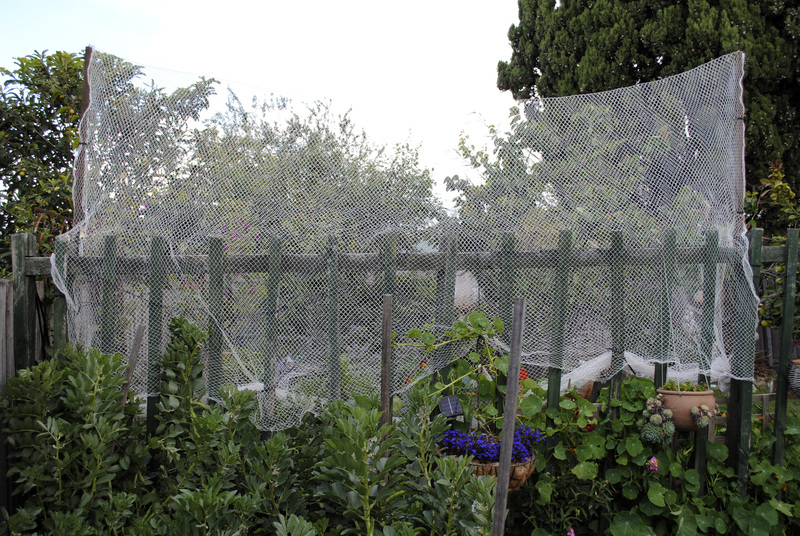 To date, I have secured ringtail possum proof netting to a fence, strengthened a cheap plastic greenhouse, securing it to the fence to prevent it flying away in the strong winds we’ve been having; and I’ve created a ‘cabezo’ – a cross between a gazebo and cabana, using old bamboo blinds and screens tied to the grape vine frame. (The grapevine died as a result of a combination of old age and concentrated possum attacks.) The ‘cabazo’ will be a perfect retreat for some shade on those 38º+ days in summer (it can also be ‘tarped’ for rainy days, but that’s another story). Badminton anyone? Unfortunately ‘Ringies’ are better known for their fruit tree destruction than their racquet skills. Both uprights of the netting frame were lashed to existing fence posts using three zip-ties per upright. 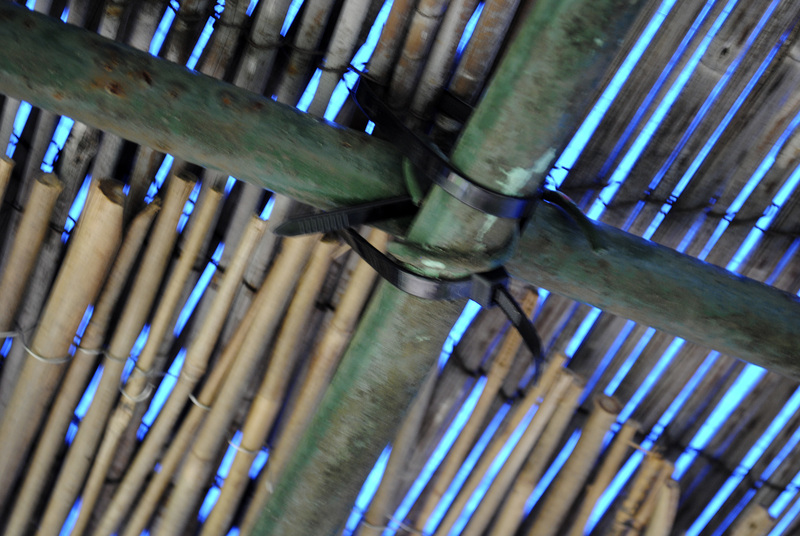 Bamboo screen roof zip-tied to the disused grape vine frame, creating an instant beach-side cocktail bar vibe. A Hurricane in a tall frosted glass, please. I always use the un-zippable versions, as I can’t stand waste, and they can be used over and over. Obviously there is a limit to their load bearing properties, but I’m still experimenting and still loving the zip tie. A word of advice – they should always be used in the service of good and not evil: i.e do not use as handcuffs. ‘Occy straps’, ‘bungee cords’ or ‘stretchies’ also had their origins in the aircraft ‘industry’ before World War 1. They were used as lightweight suspension for undercarriages on homebuilt aircraft, and still are. Elastic is a one-trick pony but it does that trick perfectly. Two essential and iconic Aussie objects combined. 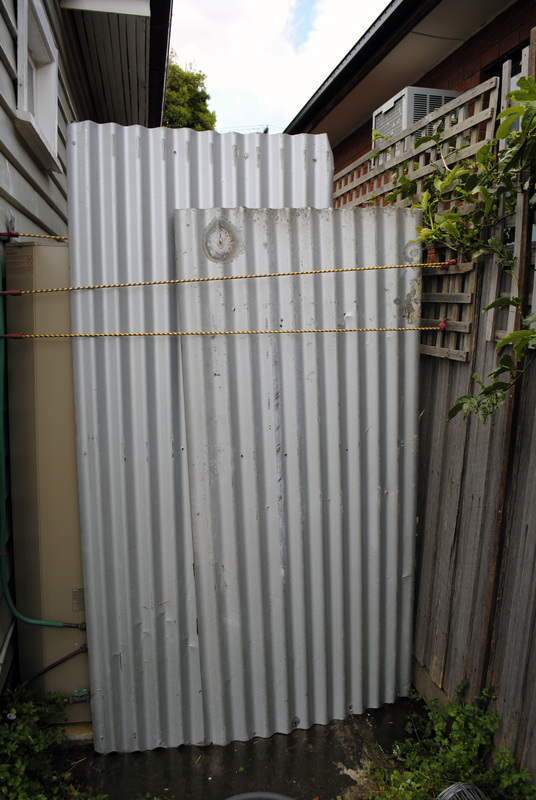 Corrugated iron sheets and Occy straps. 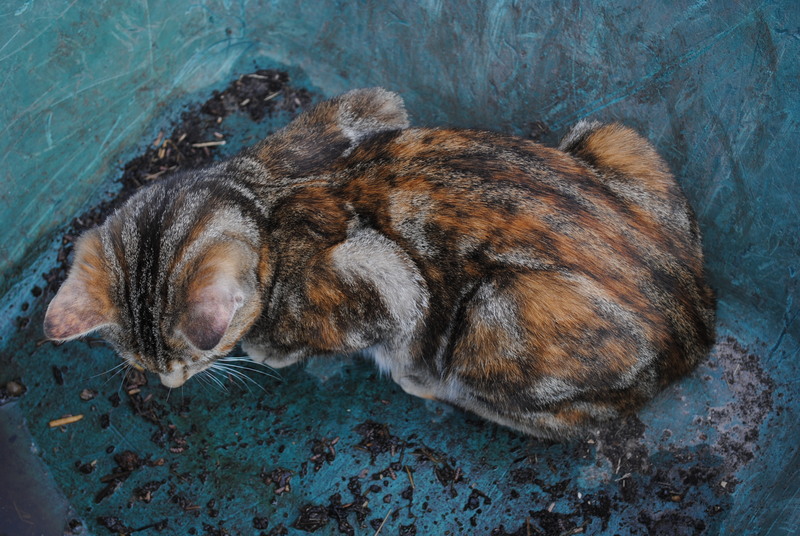 Daisy’s natural feline curiosity thwarted. 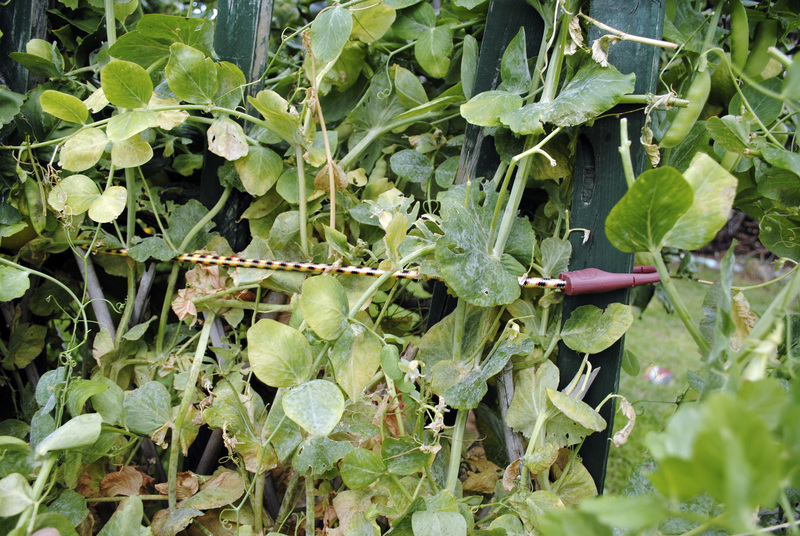 Occy straps are also a quick and efficient way to hold back or structure meandering and climbing sweet peas, snap peas or beans. 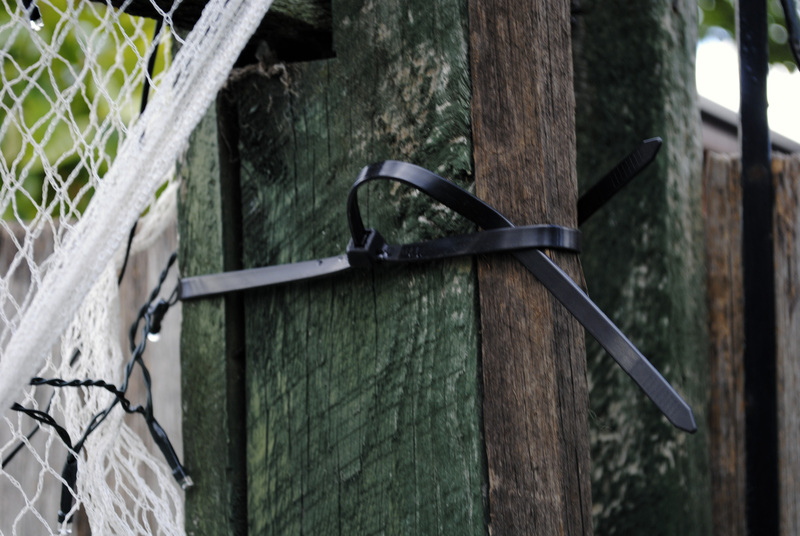 Occy straps can be stretched and secured on a fence or trellis. Some gentle restraining of nature. Occy straps can be reused, removed and repositioned. Don’t struggle little climbing snow pea, I promise I won’t hurt you. I admit that the lurid contemporary patterns of the Occy straps would be less than aesthetically pleasing in a picture postcard flower garden, but I’m talking about working, productive gardens. Gardens that give succour to our senses and nourish our bodies – pragmatic, rational and inventive. Daisy, with the full complement of her nine lives intact. Really Great! Amazing to know that zip tie was invented for aircraft industry. I think now it is used in the every field for different purposes. Thanks for sharing informative blog.